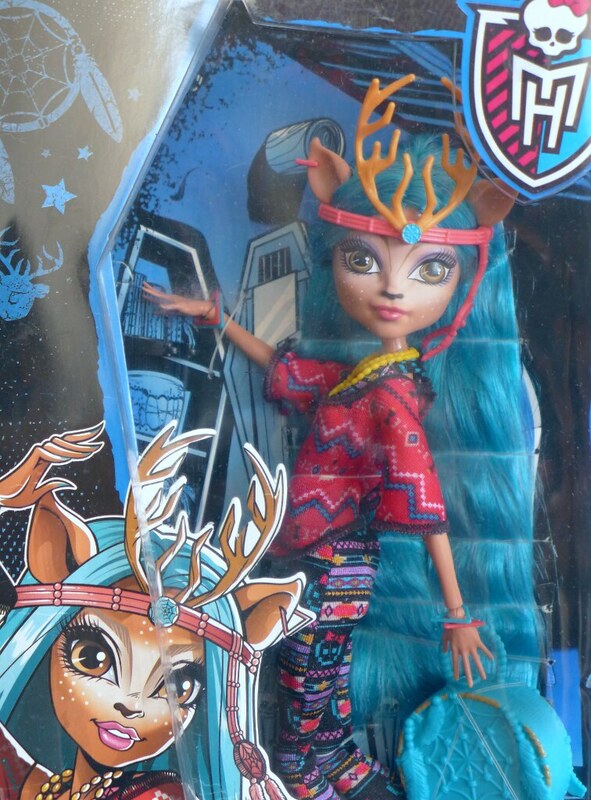 A few months ago, Monster High might have as well not existed at all, as far as I was concerned. 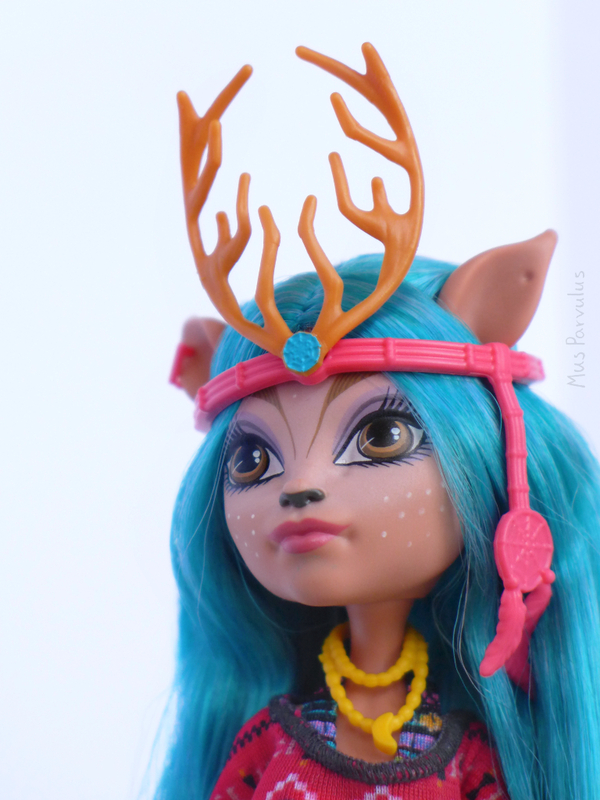 I skipped Monster High products altogether when browsing dolls online. 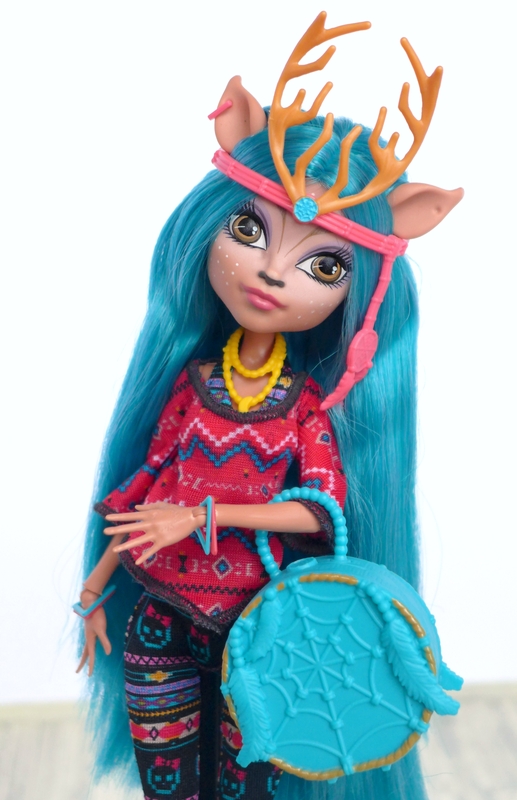 However, one day, my husband pointed out a doll on the page that I was browsing – a Monster High doll I would have ignored, as usual. It was Isi Dawndancer. Now I am in love and I can’t believe I could have missed out! 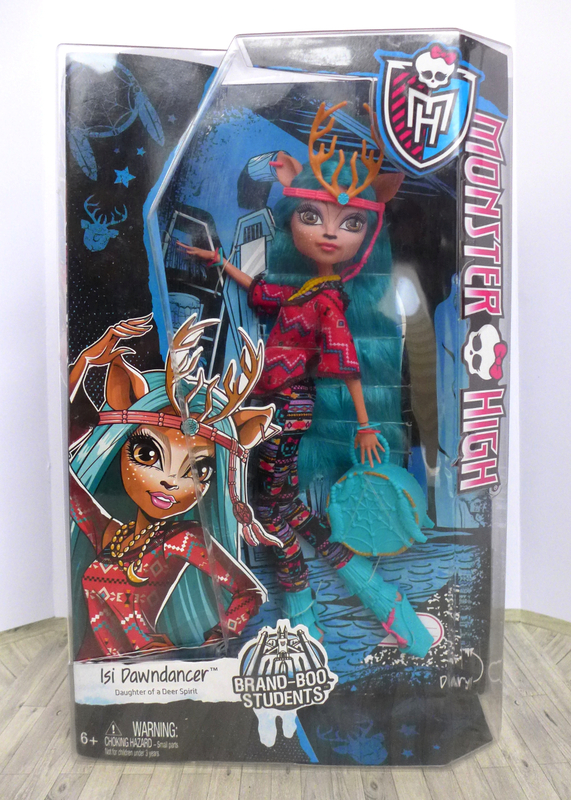 Isi Dawndancer is a one of the Monster High’s “Brand-Boo Students” – a line of characters visiting the school as a part of a student exchange program. 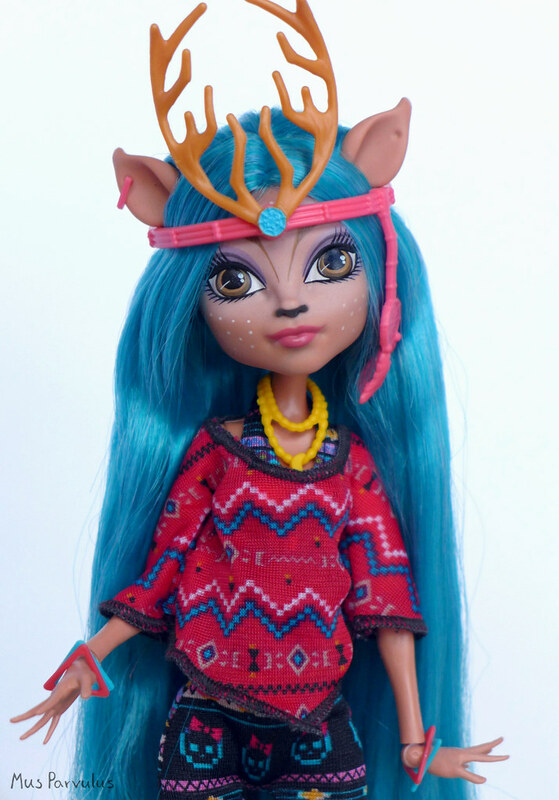 According to the manufacturer’s information, she comes from “Boo Hexico” and is a descendant of a Deer Spirit”. 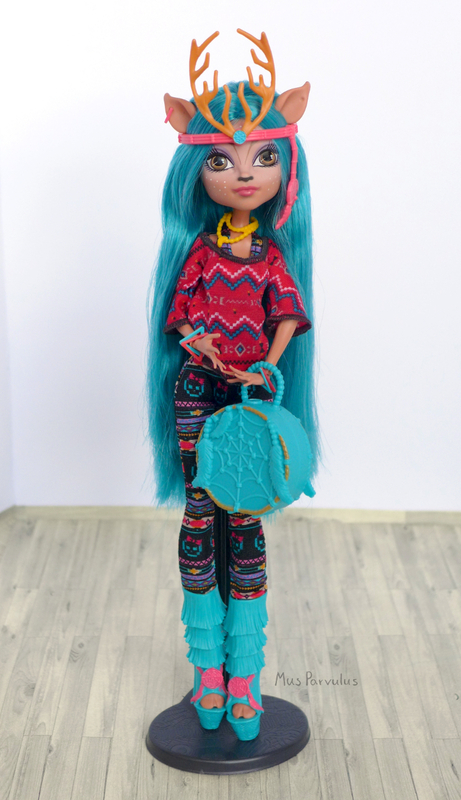 This is Isi’s first (and so far only) doll release. The line became available for sale in 2015, but they can still be found new in their boxes. 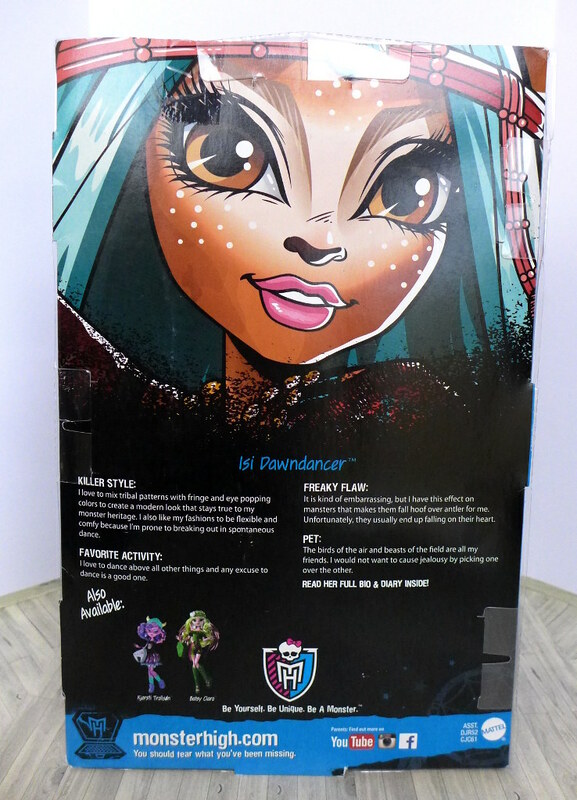 In fact, this is my first all new Monster High doll that I get to unbox! Mine came a little bit worn, which detracts from the art, but I hope that the picture gets across the general feel. Even after deboxing the doll, I find it hard to part with the package! 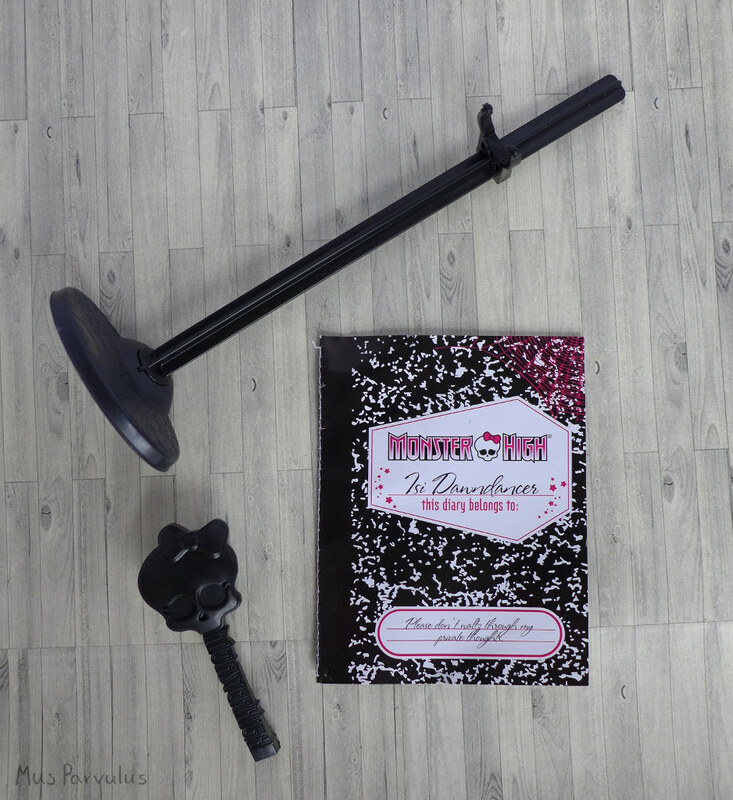 Upon unboxing, you will discover a few non-wearable doll accessories: a stand, a brush, and a diary. 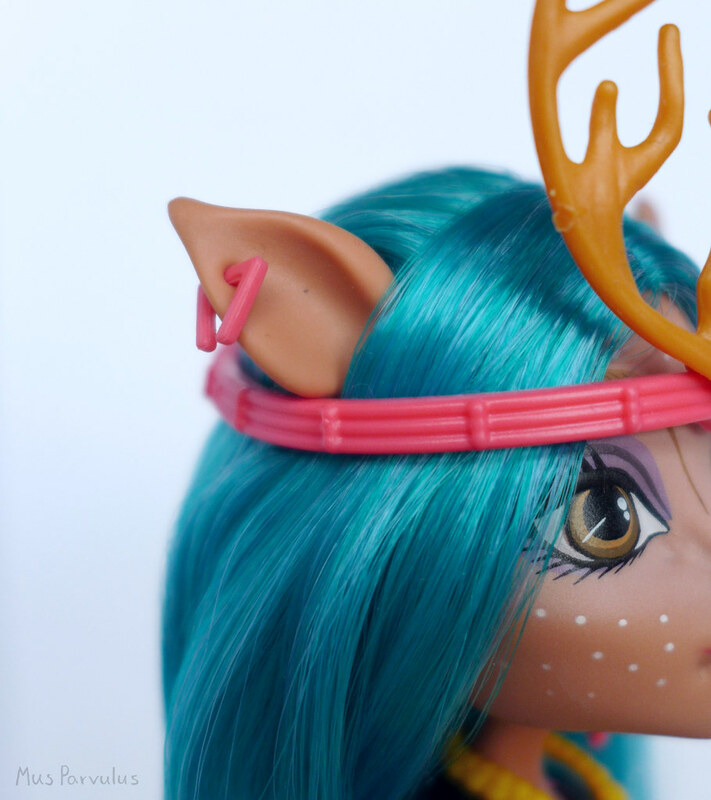 The brush seems slightly better than the Ever After high brushes, but still, the ‘bristles’ are sparse and overall, I wouldn’t like to have to rely on it for actual doll-hair brushing. The inclusion of a stand is always a positive – although, don’t mind me occasionally switching it up with an EAH one for subjective reasons throughout the review. Isi’s body is mostly the same as that of other classic MH dolls, with a few personal touches. Her face is beautiful. 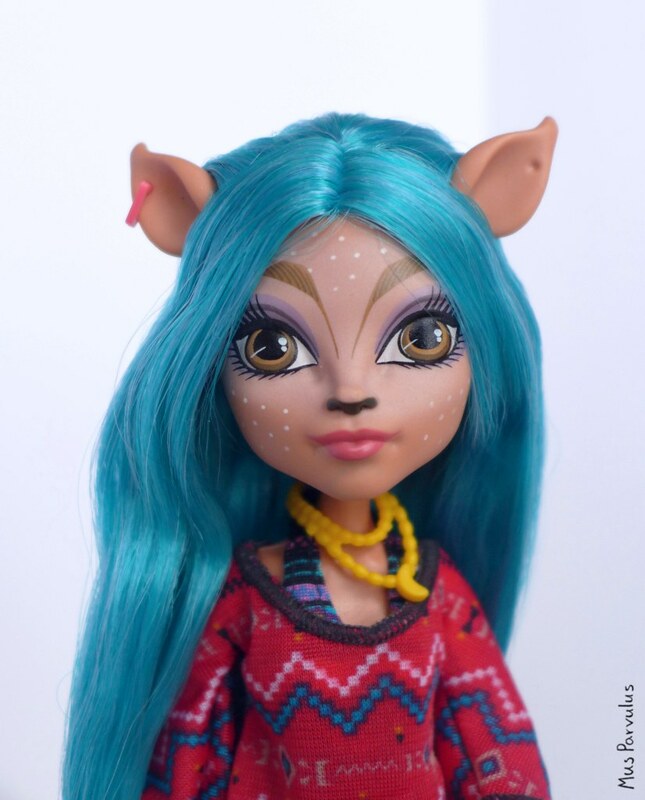 I did not know you could make an animal-inspired doll with so much grace! She is a very non-disturbing blend of human and animal. Her make up – the violet eye-shadow and pink lips – is both girly and subtle. It doesn’t seem to directly match her outfit – something I may be overly conservative about – but it certainly doesn’t seem to clash with the other colours either. 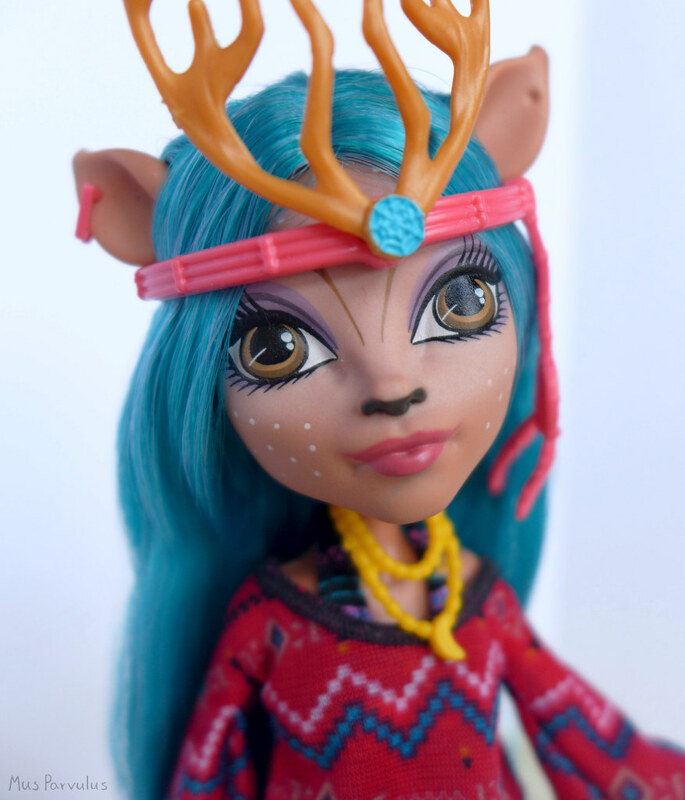 Here you can see the details that give Isi her deer characteristics: Elongated eyebrows, a black nose and adorable white dots. It may not be obvious from looking at the photo, but the area around her eyes is lightly shaded white, to mimic the markings on real deer. The doll’s hair is amazing. I can’t find any fault with it. The colour is wonderful both in itself and in combination with her terracotta skin tone. It is long and silky, free from any gel or glue. There is a very thin strand of hair which is longer than the rest, but the ‘problem’ can be solved with one quick snip, so I won’t even count it against her. 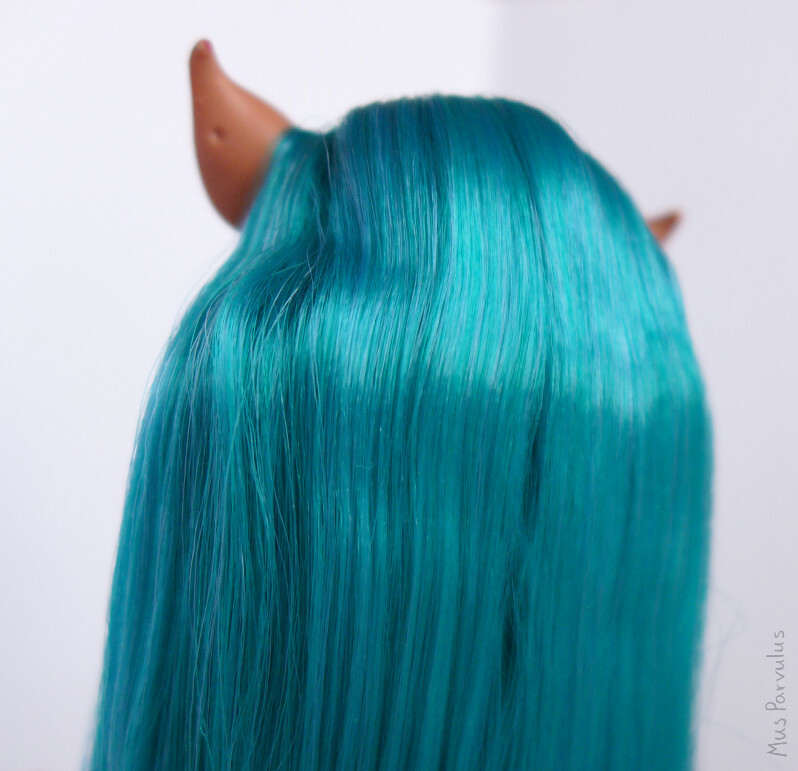 I had heard positive things about this doll’s hair prior to owning one, and I had trouble understanding why simple, straight hair caused reviewers to sing praises about it. No gel or tangles should be a given, not a special treat? Now I think I do understand the excitement. 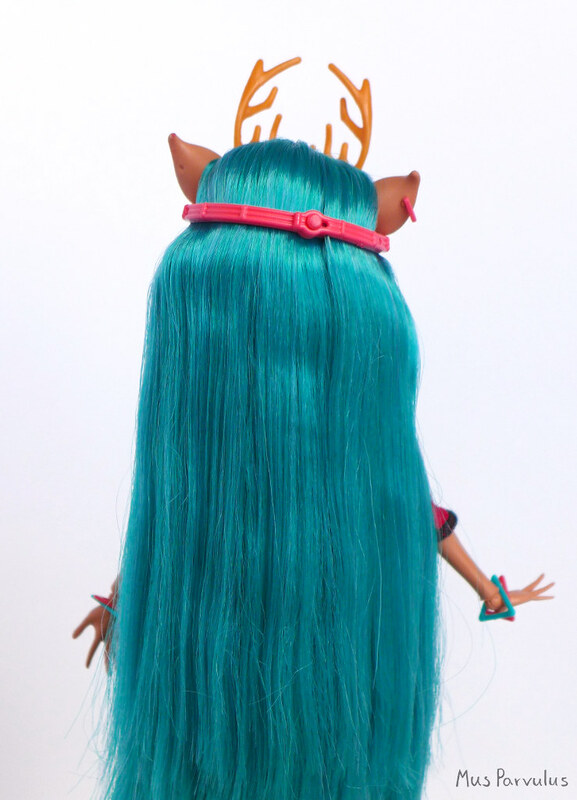 The hair is so, so pleasant to touch, and, on the practical side, it’s so convenient when you don’t have to boil wash a new dolls hair first thing out of the box. It is fit and ready to be enjoyed. Overall, a very good looking deer lady. 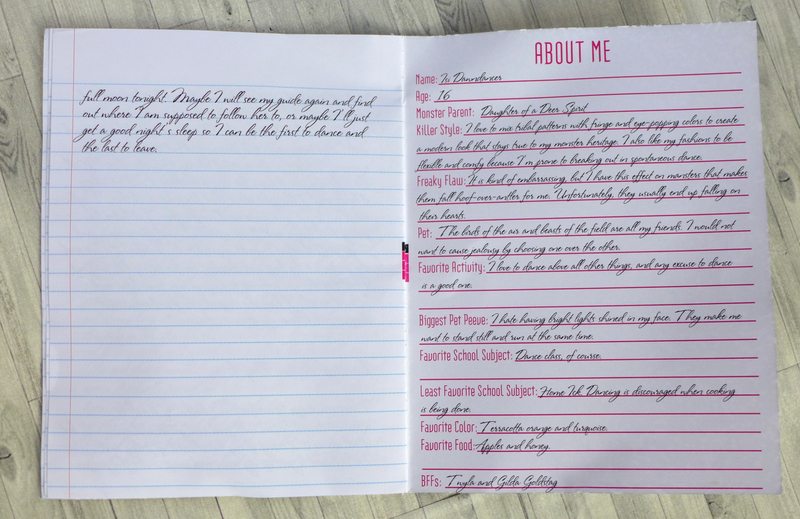 Isi’s diary states that she likes to dress in clothes that are indicative of her culture and tradition, but with a modern spin. Indeed, her clothes are covered in colorful, Aztec-like patterns, finished off with a few surprising details. Her leggings share a similar style to that of her blouse, but with the addition of the MH logo designs – the so called ‘skullettes’. To be honest, I think they don’t make a lot of sense and I wish there weren’t any, but at least they blend in fairly well. 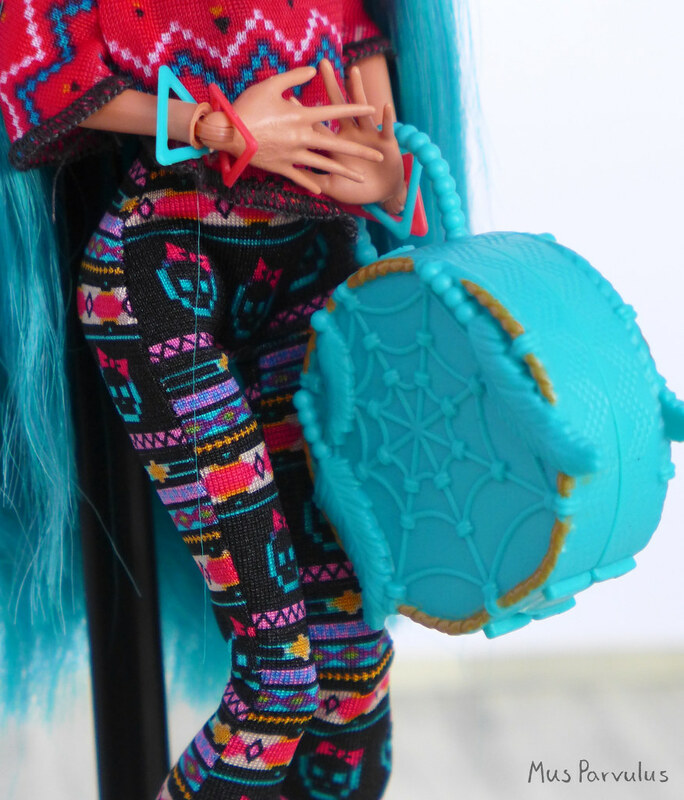 Mattel seems to like to incorporate ‘creepy’ elements into Monster High dolls and their clothes, but I feel like this time they have restrained themselves, with very good results. The twist here is that the leggings are actually no leggings at all, but rather constitute a part of a jumpsuit which comes to a halter top. It closes with a velcro in the back and on the neck. Once again, the cut is relatively simple – no darts, no nothing, but it fits perfectly. And it’s not even stretchy. She kind of looks quite like a diva in it, doesn’t she? It is a clever idea: the antlers are a very recognizable ‘deer’ element, certainly worth incorporating in the design; thanks to the headband, they don’t have to gender-inaccurately grow out of her head. Even being just a decoration, the antlers look quite impressive. On one side, there is a hanging dream-catcher with feathers attached: one of many incorporated in Isi’s outfit. It looks girly and charming flowing down her hair. The headband is removable, it closes in the back with a little peg. It is easy to remove (but seems secure when closed). 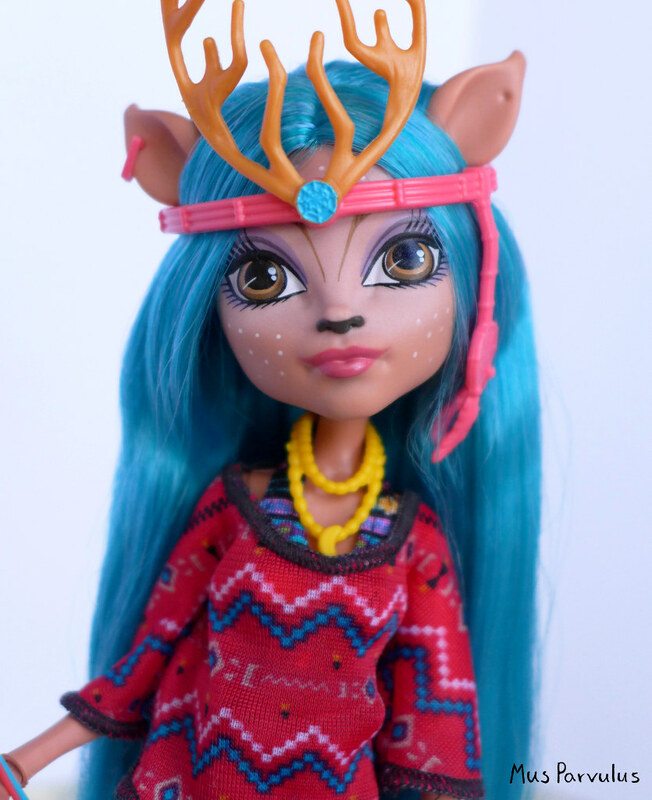 In one of the deer lady’s ears, you can see a triangular earring. The ears are relatively soft and pliable, so it’s entirely possible to take it out or switch out for a different one (no replacements are included, though, so you’ll have to be creative). The other ear has an indentation but isn’t pierced. I’m impressed that she came with so many of them. Certainly, the amount of plastic used to make them can’t be too costly, but even so, such accessories seem to be becoming more and more rare. The bag is a big dream catcher decorated with beads and feathers. It has very nice moulded details, but would perhaps looks even better had they been painted as well. It is, however, a functioning one. It opens at the top. 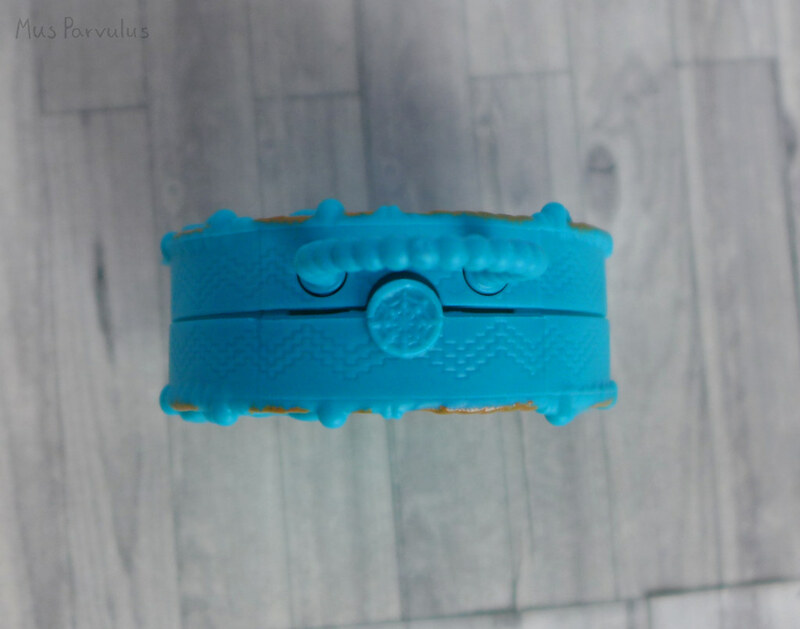 The clasp is also a dream-catcher. The bag is similar to her shoes in colour and detail. 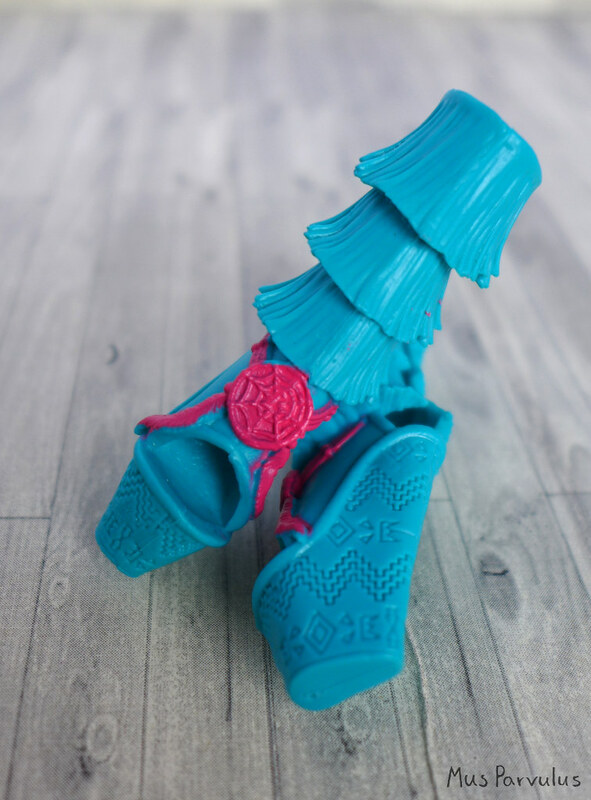 They are both turquoise, have feather and dream-catcher details and a similar pattern – in this case, carved into the base of the shoes. The tops part resembles layers of fringe. I quite like them. 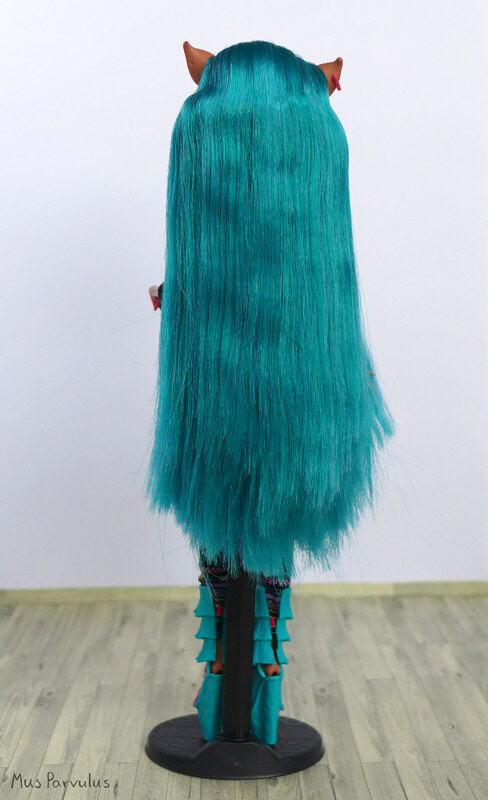 It’s not something I would be likely to wear myself, but I appreciate that, in all their intricacy, they remain fairly realistic, so that some other human being (not me) could wear life-sized copies. They could absolutely be used with other doll outfits and that’s a big plus for me. In the back, there are long slits. I imagine that without them it would be impossible to put the shoes on the doll. Finally, Isi wears a yellow necklace. 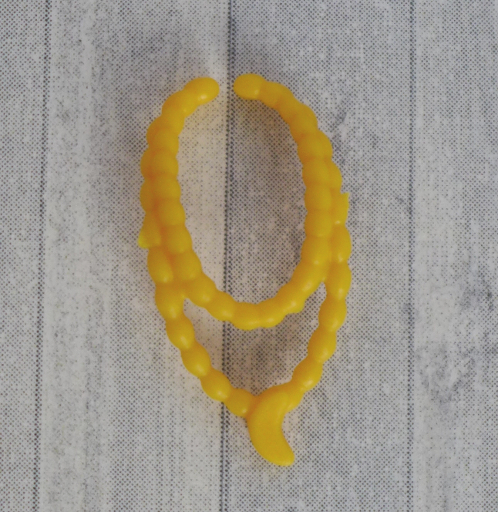 It consists of two rows of yellow beads and a crescent moon pendant. It has an opening in the back for easy application. It doesn’t strictly match her other accessories, but it doesn’t look offensive by any means, but rather brightens up the outfit. Somehow, all the clothes and accessories work well together, creating a rich and pleasing sight. ‘Somehow’, because they are eclectic. Not only in their colour – I would have hesitated over putting together red and pink – but apparently it is only a problem in my imagination – but also eclectic ethnically; apparently, according to the reports of people who know more than I do, Isi wears together elements suggestive of different native American tribes. 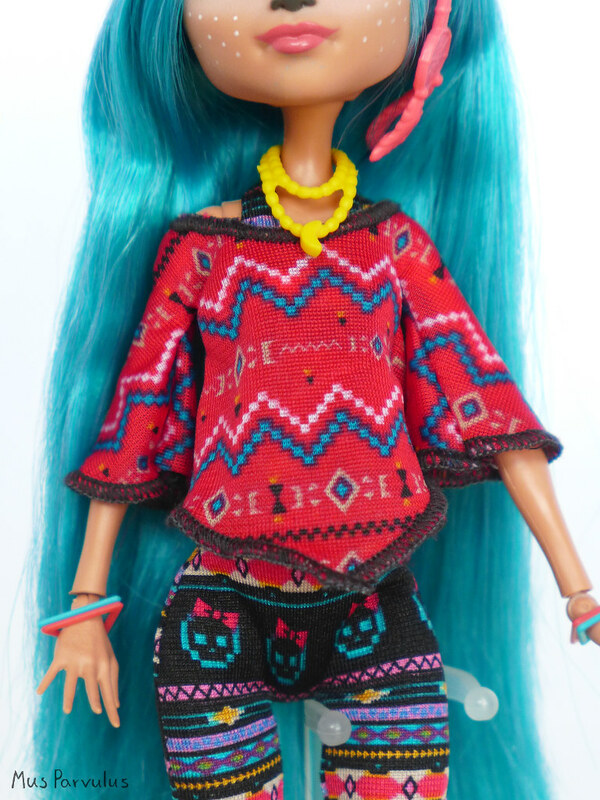 The sad fact of collecting playline dolls is that they are rarely flawless. This can cause such a heartache when you finally get to unbox your dream doll. Luckily, there haven’t been any unforgivable defects with this doll, but still certainly a few imperfections. I’d like to start with a perceived flaw that appears to affect all the Isi dolls, not just mine. The eye ‘stamps’ seem to fall outside the boundaries of the eye-shaped indentations. It looks like her eyes were supposed to have their inner tips pointing further downwards. I don’t know if this is a factory mistake or the result of a sudden change in design. Either way, it is something that I definitely did notice, but I am not particularly bothered by since the doll still looks lovely (and since it’s not just me getting an unlucky one but apparently a common issue). Her left eyebrow (right one in the photo) is also slightly asymmetrical to the other one (which looks altogether more neat than her sister). Again, this is hardly noticeable, but I would have preferred if the face details were all perfect. Another minor error can be seen in one of her shoes. The paint is smudged. Fortunately, this should be easily removable with some acetone. It is subtle enough that you might miss it at first glance, but it’s definitely there, and more noticeable in person. It bothered me enough to want to try to remove it – which I did after the review – but it was a stressful procedure because of the threat of messing up her beautiful lip paint. In the end I did a decent job – as in she looks alright, but despite utmost care I may have dissolved a fraction of a millimeter of her lips indeed. Finally, I want to address something that I believe is not a defect: it is fairly easy to catch Isi on camera looking wonky-eyed. I don’t know if this effect is caused by distortion in cameras, but I just don’t see it in person. 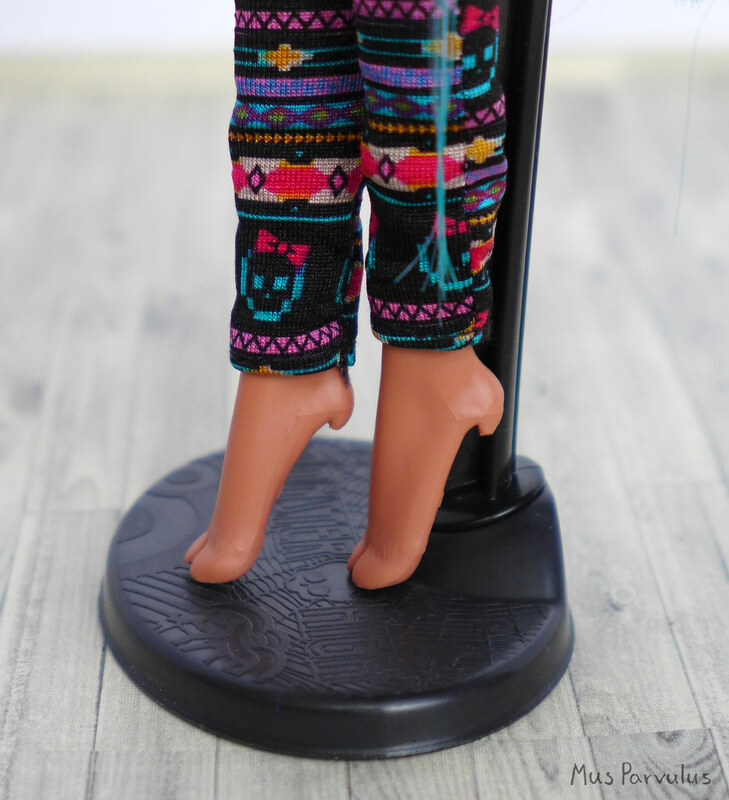 Before making a purchase, I have seen photos and videos where the doll looked unflattering at certain angles, and occasionally people commenting on it in a negative way. I too had resigned that she may indeed have a slight wonk. But actually holding her in my hand I feel like it only happens on camera. Isi Dawndancer is another doll in my collection which in the overall design is near perfect but slightly lacking in the execution. 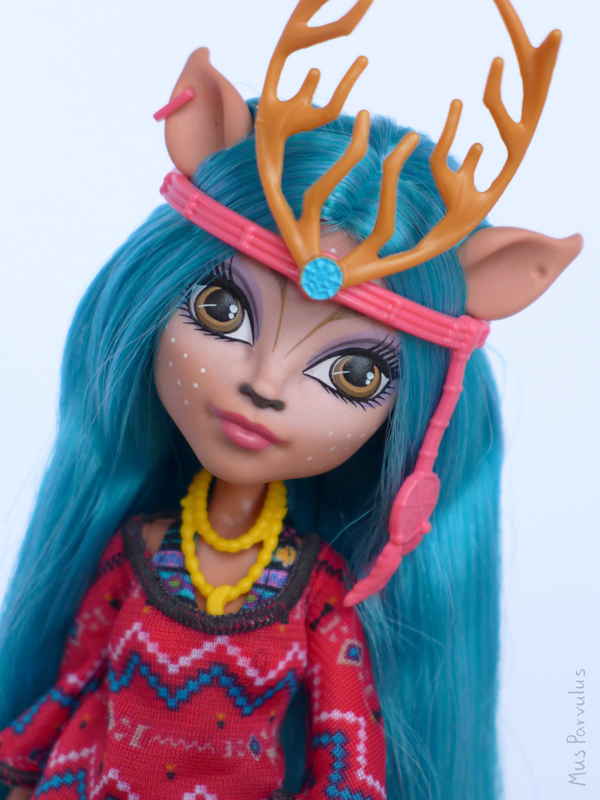 Isi is unique in her likeness to a deer, but her extraordinary facial features do not in any way disrupt the overall impression of sweetness and beauty. Her clothes and accessories are an important aspect of her design and add even more personality to the mix – although they certainly aren’t her only way to impress. As I mentioned, there are flaws. I see them as just that – little factory mishaps, since apart from the paint smudges, the overall quality is satisfactory. That said, a critical paint error can ruin your enjoyment of the doll, so if you do intend to get one for yourself, it’s certainly safer to pick one yourself or ask for real photos when buying online. Overall, I do think this one of a kind doll deserves her place in a collection, and now that she is still available new in box may be a good moment to make a move. Though, as always, it a question of taste. I know I love my Isi Dawndancer and I can definitely imagine her bringing as much joy to someone else.